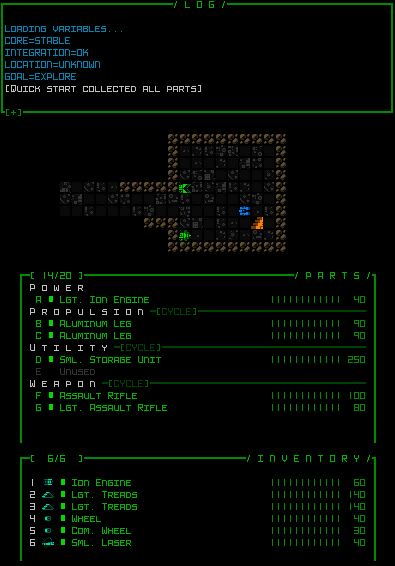 Cogmind :: Beta 4 "Data Mining"
I've made a number of adjustments to the early game explicitly aimed at 1) making it a little easier for new players and 2) further streamlining it for experienced players. The most significant change is that -10/Materials was almost halved in size. This will make finding exits even quicker, even if you're just wandering aimlessly, having not yet figured out the layout patterns and other clues that tell you where exits are likely located :). Of course the contents (and obstacles! are scaled down correspondingly, so overall your first evolution will come that much faster. Patrolling Swarmers will also never come in 4's, only 3's. Those changes only apply to -10, whereas all Materials floors will also usually each have one or two special stockpiles with slightly better gear. These are easy to spot. Even the starting area has been updated, providing a guaranteed Sml. Storage Unit. Carrying spare parts is important for survival, and it's fairly easy to acquire storage units very early on, anyway, so may as well start with one. This addition also made possible a new advanced.cfg option, quickStart, which automatically collects everything in the Scrapyard, attaches what parts it can, stores the rest in inventory, and puts you next to the exit ready to go. This starts you out with middle-ground Leg propulsion, but carries everything else along too in case you want to switch (or lose something! ), and because it's never good to leave spares behind if your inventory isn't full! Those of you going crazy with explosives in Materials will also (maybe? :P) be relieved to know that the impact on alert won't be as significant as before. Instead of a static value, walls now gradually increase in value the higher into the complex you reach, peaking at the original Beta 3.1 levels for late-game areas. Setting off a chain of reactors will definitely still spike your alert, but not quite like it used to. Some other features/changes also impact the early-game experience, but are covered in their respective sections below. Not a lot of robots have traits and outright immunities, and they're usually found late in the game or in out-of-the-way areas, but those that do will now show them in their info window. Immunities are listed right along with Resistances, and as with all stats have context help to describe them more specifically. Traits got their own sub-window. These are passive effects originally intended to be discovered by observation (or via lore) as they originally only represented non-essential mechanics, but then a couple were added that happen to be pretty important in certain cases, thus it's time to make them all fully transparent. One of the farthest-reaching gameplay changes to Cogmind with Beta 4: All those distress calls you see are now visible. Notified combat robots are temporarily marked with yellow indicators, revealing their location when otherwise out of view. This is especially useful when facing Watchers, since their alert range is relatively large. It'll be helpful for new players still learning about the world, as well as tactically relevant to all players since knowing where those signals are headed makes it possible to react by advance repositioning as necessary, or otherwise plan for new company. 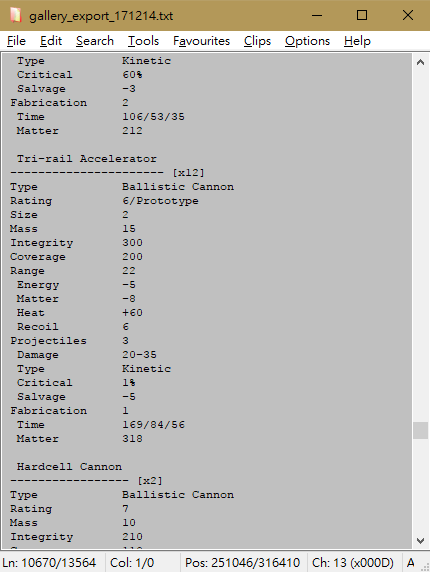 Cogminds using sensors could more or less already do this, so this change is even more relevant to full combat builds that may not have room for sensors. Garrisons called for reinforcements will also be revealed, but in red. Fortunately it's also the rarest one, and also can't even occur while your corruption is low. That's a restriction enabled by a new threshold system--not all effects are possible at all corruption levels, so no more misfires at 1%. The thresholds aren't exactly high so you'll still want to keep your corruption minimal, but it'll be helpful in avoiding ultra-low-corruption mishaps. Wouldn't be a Cogmind update without some good old QoL! Operators summoning reinforcements also have a new global ALERT message, meaning they also trigger the on-map alert and sfx. Can't miss it, and you'll also know exactly when that Operator which spotted you (or was even just alerted to your presence indirectly!) reaches its terminal and calls for help. 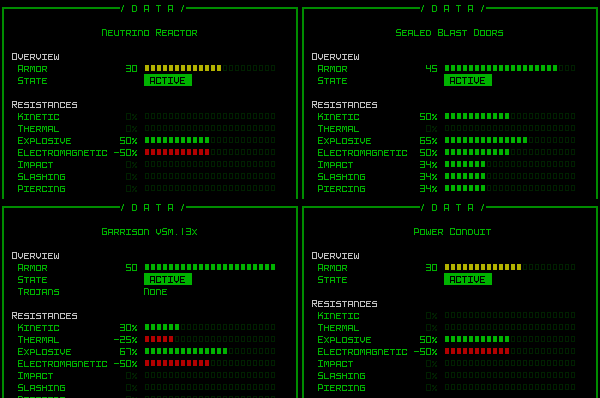 We get a lot of questions about the damage resistance system in Cogmind, which was implemented more as "damage modifiers," and previously called such. 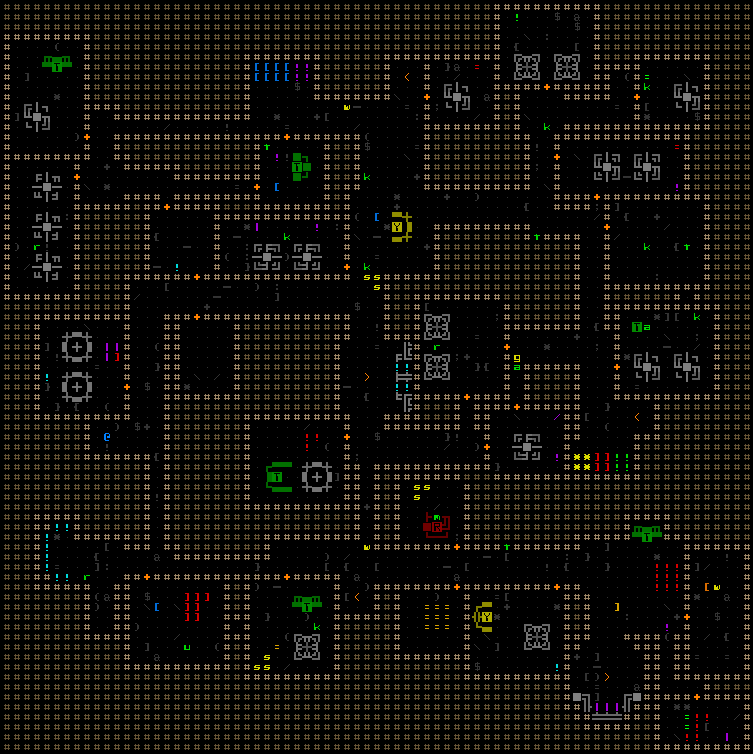 (This was a remnant of Cogmind's origins as a 7DRL[cogmindrl.blogspot.com] based on an X-Com remake[cogmindrl.blogspot.com].) The meaning of the values was explained in the context help, but it's better to switch over to a more intuitive "Resistances" system found in most modern games. Here positive values represent resistance against damage, and negative values a weakness. 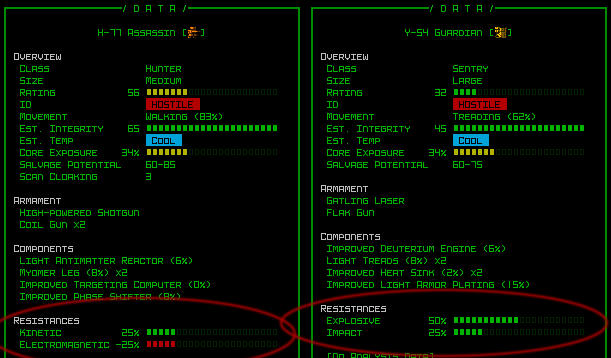 All objects use the new Resistances display, not just robots. A new advanced.cfg option (preciseCorePopup) shows core damage popups as actual core integrity rather than a percentage. Many of you probably don't even know challenge modes are a thing in Cogmind, but they've been in there for a long while and even have a dedicated leaderboard[www.gridsagegames.com] (at the bottom). They're described in the manual, and we have an ongoing list on the forums[www.gridsagegames.com], but they don't have their own in-game menu yet so it's not as easy to discover them. For now they can be activated by setting the relevant advanced.cfg variable, but we'll be getting an in-game selection menu eventually--I'm still waiting on some other related features first. "Simple Hacker" mode completely removes the ability to do any indirect or manual hacking. "Fragile Parts" mode destroys any part that is removed (basically everything acts like a Processor). "Sticky Parts" mode is an even more extreme variant in which no parts can be removed at all--the only way to get rid of them is for them to be destroyed (think twice before attaching a processor :P). "Trapped" mode is less a challenge than a different way to play, since you can build specifically to take advantage of this scenario, but it fills most maps with a lot of traps. There is also a +20% chance to trigger a trap. Time for some data mining! You can now export all your item gallery data, putting the stats in one of three formats, whichever works best for your needs. Most useful for the average player looking to compare items is the HTML export, with a table of contents linking to each section, where items are divided by slot type and show only the set of stats relevant for that category. 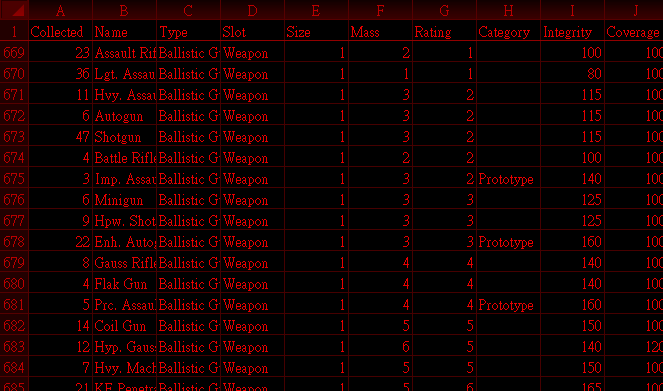 The TXT export is good only because items list only stats relevant to them. In any case, these offer new ways to explore the items you've discovered so far. 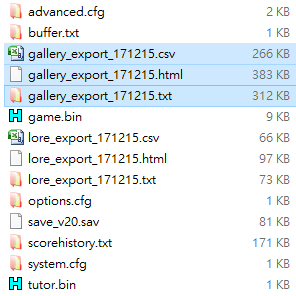 Both the lore and gallery UI also now show the file path and name of the exported file, so you know it happened and where to retrieve the results. The buttons were also redone and for keyboard players are referenced via T/H/C instead of 1/2/3. I added support for WASDQEZC movement, but it's not native like vi-keys and the other common movement options. Technically all I did was create a keybinds file remapping existing WASDQEZC commands to vi-keys, so this was possible before, but I'm doing an official one since it's fairly easy and more players might want this. To read more about it, and how to activate it, check out this post[www.gridsagegames.com] on the forums. 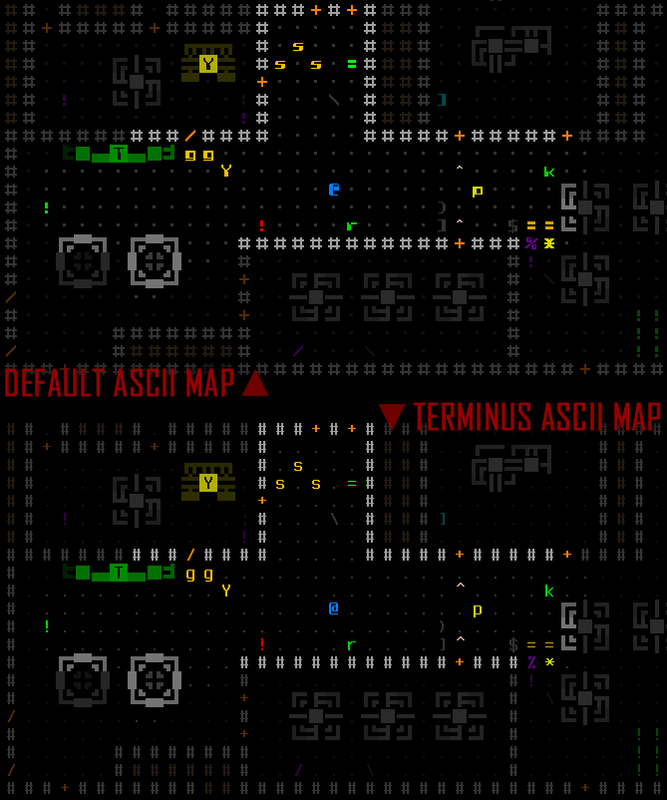 I've also added an option to use alternative map ASCII, giving it a more traditional roguelike look with Terminus rather than Cogmind's default square sci-fi font. The main purposes here was to improve readability of the ASCII mode map for those with low vision or on tiny high-res displays. It's not in the options menu, and currently only works at size 18 (our most common font size at 55.3% of players), but I could add it at more sizes depending on feedback. Those capable of using font size 18 can enable this option by opening data/fonts/_config.xt and setting the new Terminus options to 1 in the Available column. The relevant new font set names begin with "18/T+". It's also worth mentioning that DeanSherman discovered Easy and Easiest mode players have always been getting essentially max accuracy with every shot, unintentionally xD. As I was fixing it so these modes applied the correct bonus, I decided based on the state of the lower leaderboards that for now it would be overkill to nerf the accuracy to intended values. After all, even with a massive accuracy boost players still die in droves, because there are quite a lot of strategic and tactical factors relevant to creating deadly situations (besides simple accuracy), so we may as well keep one of the more easily controllable variables a net positive rather than yet another factor to contend with. So now these modes get a +20/30% boost, respectively. This means shots in certain situations will miss a little more than you might be used to in these modes, and the challenge will go up a bit, just enough to need to pay a little attention to accuracy factors (and make targeting computers actually somewhat useful!). Beta 4 saves are not compatible with previous versions, but even if you're on Steam and have autoupdates enabled, Beta 3.1 is still available via its own branch and you can roll back to finish a run in progress first if you like. Hehe, true they were, and their description didn't even reflect that because to make them more useful I'd broadened the applicable range of their effect but had forgotten to update the effect description xD (So most people didn't even realize how good they were made recently...) In any case, I thought about them for a long while but there were no good solutions to adjusting them without either making them too bad, too good, or requiring a dedicated UI. So sadly they had to be removed. Maybe they can make a comeback one day as something else! That's one hell of an impressive and descriptive changelog, dear sir! Additional note: To me, even better than randomization (which would be limited anyway) is to add even more items with crazy effects and brand new mechanics--really effective stuff you can build entire strategies around. A fair number of these already exist, but I have lots more plans for this category later assuming I can afford it! Full randomization wouldn't suit Cogmind's design, but some kind of randomization could potentially happen one day. There are a zillion fun long-term features, just not sure how many of them I can afford to do! I don't think the idea of DLC works with Cogmind, so it can be hard to pay for long-term features beyond a certain point. In any case, that would be a post-1.0 feature of some sort, if it were to happen. The only major features I can absolutely promise will happen are those on the FAQ roadmap, but there are tons of things I'd love to add if I can. Real question tho might we ever see random GUN generation? You're welcome, nico~, plenty more Christmases to come! I'll be talking a bit about Betas 5 and 6 in tomorrow's SITREP. Awesome, this game is so wonderful. 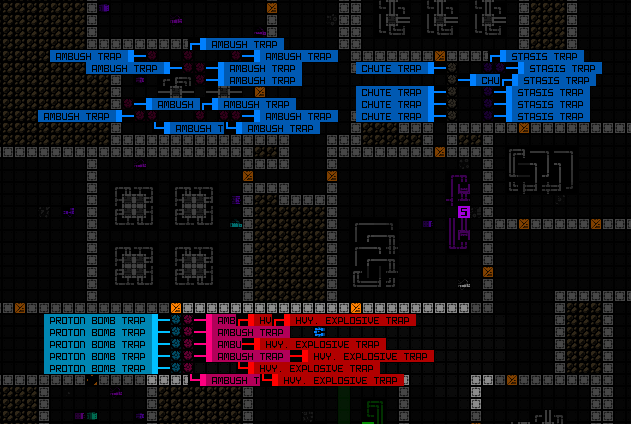 Every roguelike on earth can stand to benefit from using it as an example. Every update feels like Christmas. Thank you, Kyz, this is amazing.